There may in fact be such a thing as a sure thing in horse racing. Every time cartoonist Pierre Bellocq, better known as Peb, is featured on the pages of the Daily Racing Form he's going to provoke you in some way, whether it's to laugh, to cry, to think or to just smile. It's been that way since April 1, 1955 when Peb's first cartoon, one coinciding with opening day at the old Jamaica Racetrack, appeared on the pages on the Morning Telegraph, then the sister paper of the Racing Form. A year earlier, he arrived in the U.S., at the invitation of Laurel Race Course owner John D. Schapiro, to do artwork for the inaugural Washington, D.C. International, which gave him an introduction to American racing and led to the job at the Form. Sometime he tackles sensitive issues, like the one where a horse chastises his jockey for excessive whipping. "You made your point, Mac," he says to the rider. Some are just about fun, like the one where a man, showing off his paddock filled with horses with incredibly long noses, says, "I concentrate on photo-finish breeding." Sometimes he knows just what to say and draw, like the poignant cartoon that showed a saddened Foolish Pleasure in his stall the morning after the Ruffian match race, wearing a Ruffian pin. 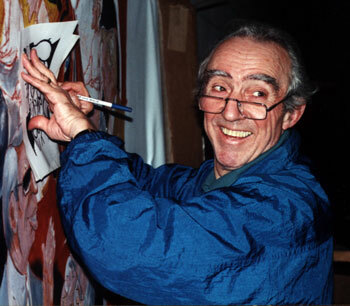 With his, imagination, his wit and his innate ability to bring out the true character of a person in his drawings, Peb probably could have gone on to be one of the great political cartoonist of his time, and, for a while, he was getting pulled in that direction. For a few years, Walter Annenberg owned both the Racing Form and the Philadelphia Inquirer and had Peb pulling double duty, doing political cartoons for the Inquirer and racing cartoons for the Form. In the early 1970s, Annenberg sold the Inquirer and the new owners of that paper wanted Bellocq to stick to politics. It was an easy decision. Horse racing, not politics, was his life. 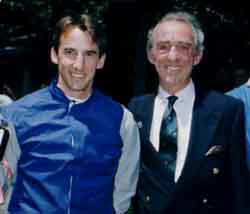 "I was born into racing," said Peb. "My father was a jump jockey in the south of France and may grandfather was a trainer. His father was a breeder. I was among horses right from the start." 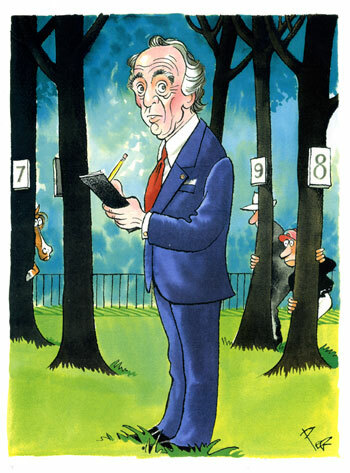 So Peb devoted the remainder of his remarkable career mostly to racing although he has enjoyed sketching other aspects of the horseworld as well..
Over the years, there have been so many classics. He says one of his favorites was the front-page cartoon for the Belmont Stakes, where he linked Philadelphia legend Smarty Jones to Philadelphia legend Rocky Balboa. He's always liked to link a race to current events. There was a cartoon depicting the notorious rogue Coronado's Quest before the 1998 Travers. He took one of President Clinton's recent explanations for his bad behavior, jumbled a few words and made them work for Coronado's Quest, who ended up saying, "Now, I must put it right. And I am prepared to do whatever it takes to do so. I have important work to do, real opportunities to seize." He even managed to make the horse and the President look alike. He says that cartoon is another one of his all-time favorites. Peb does Smarty Jones for the cover of Daily Racing Form. Another gift is his ability to bring out the character of the people he sketches. Jack Van Berg is rough and gruff. Julie Krone is an imp. Bob Baffert is confident and just a little bit cooler than anyone else. You always know more about his characters than the color of their hair or the shape of their noses. "It's almost some kind of mystical thing to grasp the inner character of a person," he said. "It's hard to explain. Naturally, you want to study the person and try to find out what motivates the person and what their character is and translate that into life." Some people are easy to draw. Some are not. 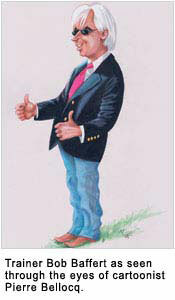 "The hardest person I ever tried to draw was Eddie Maple," he said. "People like him that have fine lines and regular features are hard to do," Peb said. "I struggled with him for a long time before I got down his likeness. Some others have been great to do, like Eddie Arcaro, Cordero, Shoemaker, McAnally, Mandella, Frankel. Frankel is superb to draw. He looks like a cat out of Alice in Wonderland." Like most of the rest of us, he enjoys the aspects of the sport that bring out its beauty and its class. You'll often find Peb working on a sketch in the paddock at Saratoga, but it will be a rare day that he's at Aqueduct in the winter. " I have tried to bring my heritage and my background from France into this job," he said. "In France and in England, you still find an element of sport and beauty that is at the heart of the racing there. I try to depict that in my drawings. In America, the outlook is a little different. I try to export from my country the sophistication, the charm and the beauty of horse racing and translate it into racing in this country with the addition of humor. Sometimes people may find what I do to be esoteric because I still look at things through the eyes that fell in love with European racing." No such explanations are needed. The important part if that he makes people laugh and think and has done so for over 50 years. It's been a remarkable run. Pierre “Peb” Bellocq, the legendary horse racing cartoonist, received The Jockey Club Medal on Saturday night for exceptional contributions to the Thoroughbred breeding and racing industry. The presentation was made by Stuart S. Janney III, chairman of The Jockey Club, in Saratoga Springs, N.Y., at a dinner hosted by The Jockey Club. Bellocq, an 89-year-old resident of Princeton, N.J., has chronicled horse racing through sketches, caricatures, and cartoons for more than half a century in the United States and his native France. In addition to his sketches in the Daily Racing Form, and more recently in Thoroughbred Daily News, Bellocq has painted murals at several racetracks. He received an Eclipse Award for Outstanding Contributions to Racing in 1980. Previous recipients of The Jockey Club Medal are Daniel G. Van Clief Jr. (1984), Jean Romanet (1985), Richard L. Duchossois (1986), Jack Van Berg (1987), Dennis Swanson (1988), Joe Hirsch (1989), Dr. Charles Randall (1990), Dr. Manuel A. Gilman (1991), R. Richards Rolapp (1992), Kenneth Noe Jr. (1993), Dr. Larry Bramlage (1994), Alan Marzelli (1998), Nick Nicholson (1998), Hans J. Stahl (2003), Louis Romanet (2007), Tom Durkin (2014), and Ogden Mills Phipps (2015). PEB is also the founder and president of the Amateur Jockeys Association, an organization which fosters the love of competitive racing by those who ride purely for the enjoyment of the sport. "Racing started out with amateurs and erupted into the sport it is today," he said during one of his many visits to Saratoga Springs to work on "L'Etalon Vert." "The (amateur) sport is huge in Europe ... The problem in this country is the word 'amateur.' In France it means 'for pleasure'; in America it means 'doesn't know what they are doing," he laughed. The AJA organizes races at almost every race track on the East Coast (including Saratoga) and features primarily exercise riders who have a passion for riding but not necessarily the opportunity or the size requirements to become professional jockeys. 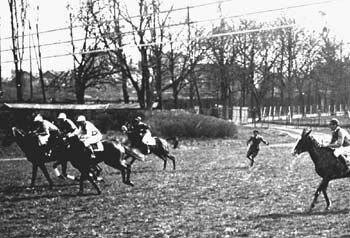 PEB RACING AGAINST THE PRINCE ALY KAHN AT ST. CLOUD. PEB IS IN THE LEAD AT THE START. THE ALY KAHN IS BEHIND THE 3 WHITE CAPPED JOCKEYS ON THE HORSE WITH THE SHADOW ROLL. 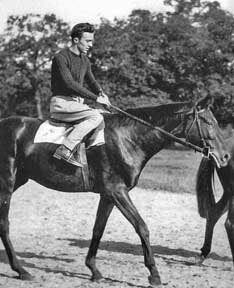 Says PEB: "Prince Aly Khan was making his "debut" at Saint-Cloud after the war under the eyes of his new bride Rita Hayworth! Of course he was 4 kgs. overweight and finished dead last. I finished 6th for my first ride ever on a horse named Moustell owned by a Swiss owner-trainer named Muri."